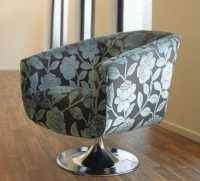 Swivel or revolving chairs always create an exciting and mobile focal point for any room. The swivel chair originated with Thomas Jefferson, the 3rd president of the USA but our chairs have come a long way in the subsequent 230 years! All our swivel chairs are high quality and are built with a sturdy metal base.